WOW….the Navy got it right! !That will be an outstanding rifle. I am familiar with the great products from SPF and the top shelf work that come from that group.The use of SPF actions was a epiphany and will surely result in a very accurate rifle for our Navy servicemen. Congratulations Jerry, Curtis, and crew! Awesome for SPF and the US NAvy. The British L115A3 Sniper Rifle is chambered for .338 Lapua Magnum. I’d of thought NATO would want uniformity on the battlefield. You really don’t want to pick up a rifle, that looks just like yours; to find it’s someone else’s, in a different caliber. Ho-hum. Nations divided by a common language, again ? Naval Special Warfare Command has been fielding .300 Win Mag rifles based on the Model 700 action for many, many years. Only in the last decade did the Navy get around to attaching a formal designation, starting with the Mk 13 Mod 0. I know there was a Mod 1 and Mod 2, but I have no idea what the Mod 3 or Mod 4 configurations were. As for caliber commonality among NATO members’ sniper rifles, there is none. However, I do know of another NATO member using the .300 Win Mag. The Germans issue the AI AWM-F in .300 Win Mag as the G22. 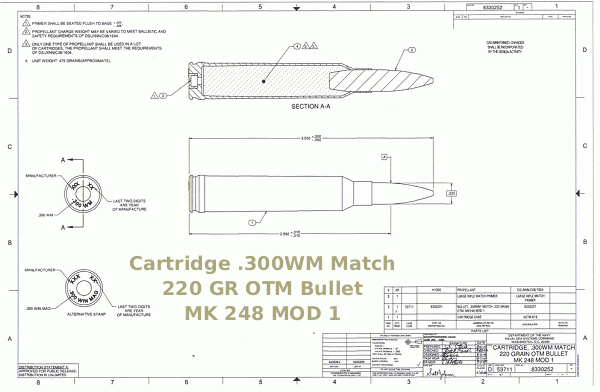 In regard to commonality between the .338LM… I found some write up on a different shooter’s forum that in testing with the 220 Matchking, the Navy observed similar ballistics as was “typically” obtained with the .338. I also seem to recall that the new MK248 exhibited better “accuracy” within the specified range as solicited by NSW-Crane. Again… as I recall. As for the varying mod #’s… I suspect that if we don’t know… we aren’t supposed to. I Googled and found the gap in the model designations too. The Army is reported to be “upgrading” their existing 700 long action weapons system. All that will be left is the action and trigger. I have to wonder just how worn out their actions are and whether trying to reuse them is cutting corners that will leave the operators in the field with something that is not what it should be. i like the weapons system but not the caliber…i would have thought that they would have gone with the 338 lapua…the 300 will get it doneand the shooters for the marines already have the data for all their 300 win mag kills…the marines will make it work…and work well…if you are looking for the best ballistics….then neck down the 300 win mag to 6.5/300 win mag..now we are talking precise….